Lord Monte and Lady Moneta Gredus cordially invite you to their annual ‘Family Ball’. An extravagant and exciting evening of pomp and ceremony. But this year tragedy has struck as Lord Monte has suddenly passed away! The family are in mourning but The Ball must go on.The audience are invited to a party like no other, where preparation is key and the underlying story is as old as time...to get what you want, you have to play the game. Matches are made, families are aligned and the game is afoot. After all, when it comes to money...blood isn’t always thicker than water. Taking an eccentric look at the themes of greed, power and family. The piece draws on influences such as Peter Greenaway, Matthew Bourne and The Adams Family, and uses Wet Picnic’s trademark style of audience interaction and eccentric play to create an extravagant night time experience. ‘The Ball’ is set around a giant chequered dance floor, (16m x 16m) that transforms in to a human chess board. The audience are placed around three sides of the space, seated and standing. The 1 hour show then takes place on the dance floor, with moving chandelier lit tables, large scale eccentric choreography and physical storytelling. Members of the audience may find themselves invited into the playing space in true Wet Picnic style! The show culminates with the whole audience being invited to join us for a party, where the host festival can chose whether a live band, DJ or audience selected dance event takes place. There were deep currents in this play: Revolution, environmentalism, animal rights, class war and capitalism, as well as any number of film references, and allusions to the style of french new Wave movies....Sardonic, vengeful, revolutionary and brooding, but very funny in a pitch black way, a well mounted sophisticated production. In preparation for their annual ball, Lord Gredus, has decided to offer some of the potential guests the chance to have a taste of the high life, a sneak peak of power, class and indulgence. His faithful staff however have other ideas in mind! So in a secret location, guests are invited to attend the Gredus Aperitif. Together they meet Lord Gredus and are assigned their own waiter. With the help of headphones, they are taught the etiquette, manners and best practice of the waiting staff, all through the medium of movement. A unique take on a silent disco; the piece will see audiences inducted into the world of the greatest servants on earth and invited into their secret plot to overthrow their master. With an explosive finale, as Lord Gredus himself is sacrificed, the piece explores the dark side of gluttony and consumerism with a gory finish. Separated into three smaller groups and assigned a waiter each, they are given instructions via headphones that will move them in large group choreography and individual play. Together they are invited to learn from the waiters and then to join Lord Gredus for a a taste of the high life, gradually building into a choreography for the entire group and an explosive ending. The piece is an eccentric take on a silent disco combined with a communal experience and thought provoking satire. 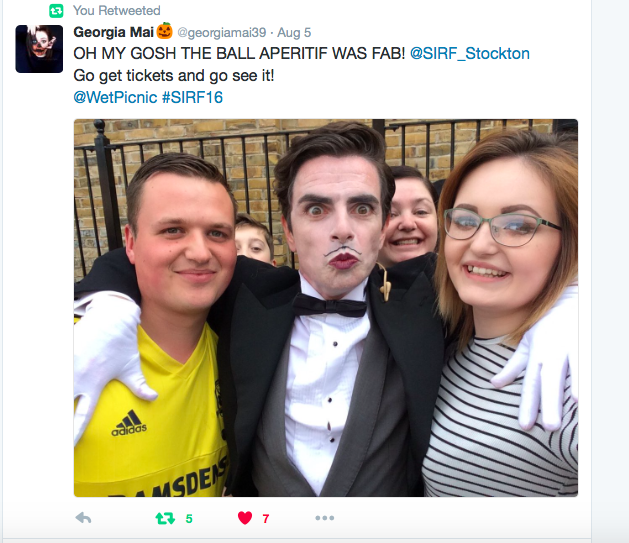 How can the Ball and Aperitif work together? The Ball and the Aperitif have been created with the types of festivals and venues we work with in mind. We are aware, that not every festival can bring a large scale show to their event and that some festivals need a show capable of delivering to large audiences. Therefore each piece sits at a different scale so that we are able to reach more audiences and work with our host venues to develop a bespoke audience engagement plan. Both shows have been developed to connected narratively, but to be able to be seen as a stand alone piece. Therefore, the pieces can be programmed together or if this is not possible then we can perform each on their own. 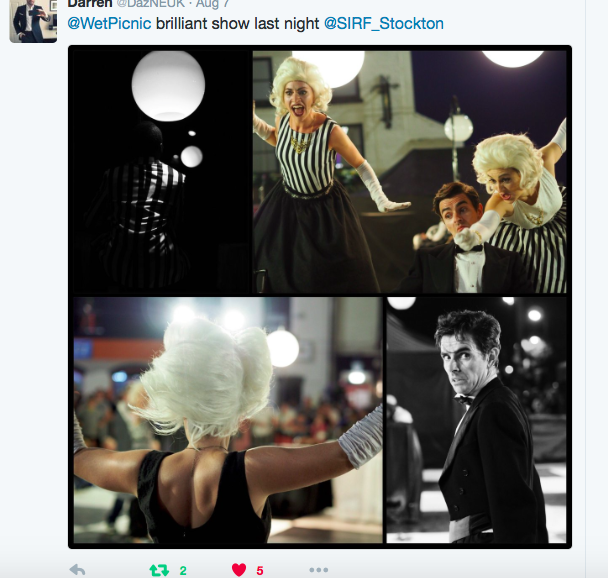 BRRTTCNLN: @WetPicnic’s The Ball is hands down the best performance at this year’s @SIRF_Stockton, absolutely stunning! Your 'ead waiter dis evening!